Dormeo has been selling luxury beds, mattresses and bedroom accessories all across Europe for the past 10 years. The company now trades in 40 countries, while being distinctively Italian and keeping product standards high. The innovative memory foam mattresses are top-notch, so if you’re keen on getting the best possible night’s sleep all year round - you’d be mad not to check out the offerings on the Dormeo website. All the Dormeo mattresses are sourced in Italy, crafted with expert care and come with a price tag that won’t break the bank. If you’re keen on getting the full Dormeo experience, you may want to check out the bed frames and divans to complement your Dormeo mattress. Dormeo gives you a number of divan drawer number options, so if you’re short on storage space in the bedroom, why not utilise this space opportunity below your bed? You can also pick from a range of 8 divan fabric coverings, and even request some fabric swatches to make sure the colours match your room scheme. How do I use my Dormeo discount code? Sign up to the newsletter and keep up-to-date with the latest exclusive offers. Does Dormeo provide a warranty? Yes, mattresses are covered for 20 years. Does Dormeo provide instructions or assembly guides? Yes, there are dedicated charts and pages on the website to answer all your pre-purchase questions. Does Dormeo offer a guarantee? Yes, the company offers a 60 day guarantee, so you have around two months to make sure the product is 100% right for you. Delivery of all Dormeo mattresses is free, though Dormeo charge £4.95 for delivery of smaller items. For more info, go to the ‘deliveries’ page. If you’re not happy with your mattress after the 60 day trial guarantee, return it to Dormeo for a full refund of the purchase price. If you have arranged an mattress exchange/upgrade you may still do this if it is within 60 days of the delivery date of your original mattress. Your first step should be to to call Dormeo free on: 0800 224 8361. Opening times vary, so it’s best to go to the ‘store locator’ page of the website, and call the phone number for the store you wish to visit, or link through to the specific store’s website. 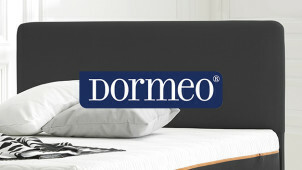 Dormeo is an Italian retailer of high quality mattresses, with a penchant for memory foam. You can grab a few bargains on the website - but don’t forget to gain extra savings by using your Dormeo discount code! Choose from a vast selection of doubles, kings and everything in between as well as pillows, toppers and duvets. Whatever your bed-shaped needs, Dormeo will deliver the bed of your dreams. Dormeo wins awards for its innovative and groundbreaking product technology. The Octaspring technology devised by Dormeo has been recognised by the aviation industry, and awarded the company a prestigious Crystal Cabin Award. The Octaspring aircraft seat has been praised for its improved comfort, better breathability, and up to a 30% reduction in cushion weight, which is a key breakthrough to help operators save fuel and reduce CO2 emissions. If you’re keen to try out Dormeo’s Octaspring technology but can’t stretch your budget to buying a Octospring mattress - why not purchase a topper, and supplement the price with your Dormeo voucher code? Whether you’re looking for a single, double, king or super king, you will find a mattress topper that will seamlessly fit on top of your current mattress on the Dormeo website. Like the Octaspring mattresses, the memory foam toppers are breathable and give extra support to key areas of the body.